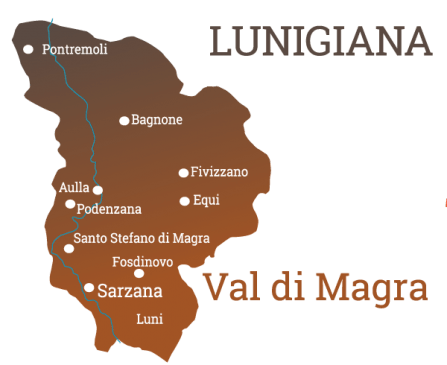 Lunigiana is a region that embraces mountains, hills and sea, passing through many small rivers. The territory touches Emilia Romagna, Tuscany and Liguria. The Val di Magra ( Magra Valley ) is a warm colors valley in the province of La Spezia. the name derives from the Magra river that crosses it and surrounds the historical cities around its basin up to the Tuscany ( Massa Carrara ). Historically the Val di Magra is identified with the Lunigiana, but long-standing issues on its borders have created a lot of confusion: we reckon it can be stated that the Magra valley corresponds to the lower historical Lunigiana. The current administrative divisions have not deleted common traditions and customs, which identify the whole valley. But here you will find also a middle land bewtween two different cultures, the Liguria and the Toscana ones, joined together after centuries of wars for the predominance upon an area which used to be of the most strategic importance for the whole peninsula: communications routes taking from northern Italy to the sea were already outlined by ancient Romans. Sarzana is a small city about 13 miles from La Spezia, a place with a long ancient history, a vivid cultural life, many great restaurants and clubs, worth to see when you get around La Spezia. Sarzana can be easily reached by train or by bus from the center of La Spezia, if you have a car you can get there in a very short time and spend the night there. It can be a good idea to stay in Sarzana and be based there to visit the surroundings, also to reach the nearby Val di Magra and upper Tuscany. Sarzana, as a matter of fact, is very close to Tuscany and is a point of partition between Liguria and Toscana administrative regions. If you have to chance to look at Sarzana from above and compare it with the Riviera, you can clearly see the very different shorelines and landscapes, one sandy, linear and flat, the other jagged, high and rocky. The ufficial border is also the geophysic one, and is one of the aspects making this region so rich and varied. The view of the brigh white Apuane Alps in the distance, sit of the Carrara marble quarries, is a unique frame to the whole picture. The natural and political borderline always marked the history of the city, theater to many battles for the rule of this important center, crossroad of many commercial and pilgrim roads, such as the Roman Aurelia and the Via Francigena. By car: you can reach in different ways several places in the Val di Magra, depending on the starting point. Sarzana is situated on the A12 highway, and the Aurelia road leading to the sea here.